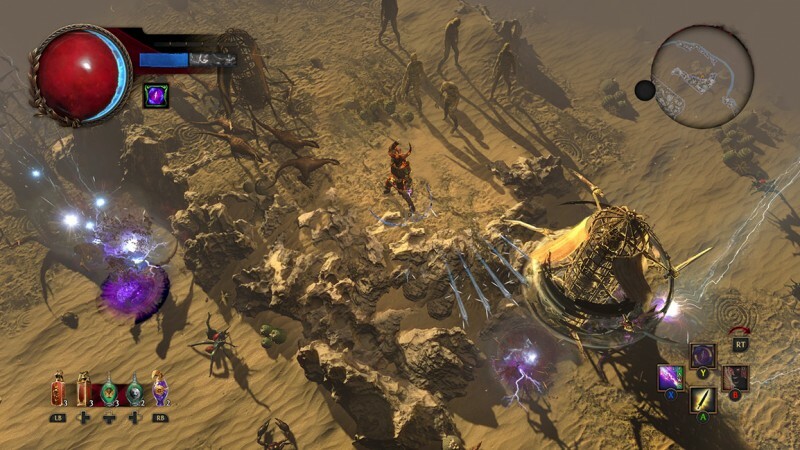 Path of Exile was already a sprawling adventure, but the action/RPG is now even bigger. The Fall of Oriath expansion adds six acts to the game’s campaign (for a total of 10, not including the end-game epilogue), stuffs monster pockets with new items and loot, and fundamentally tweaks the game’s difficulty and progression path. And, nearly four years after the base game officially debuted on PC, it’s finally available on Xbox One. Grinding Gear Games has methodically finessed PoE since release, and players who drop into this dark fantasy world for the first time will reap the benefits. If you’re new to the game, getting settled can take a little while. 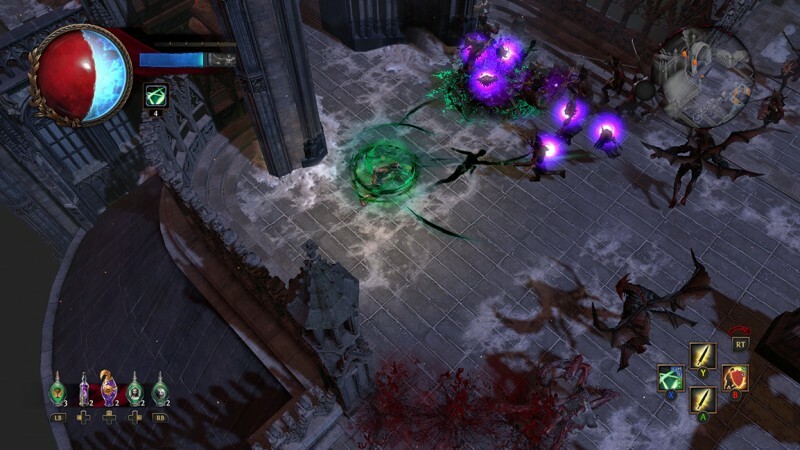 On its surface, it’s a straight-up Diablo clone, with the same presentation, environments, and overall flow that creates an immediate sense of familiarity. While it certainly shares foundational elements from Blizzard’s series, Grinding Gear Games veered into a different direction. Or, more accurately, a whole lot of different directions. One of the things I like most about PoE is the sheer number of gameplay systems and microloops that are available at any given time. The most notable (and perhaps notorious) of them is the game’s massive skill tree. It’s an intricate web that all character classes share, giving you the ability to slowly devote points into becoming a powerful archetypical hero or dabbling around to develop a hybrid that fits your own personal playstyle. 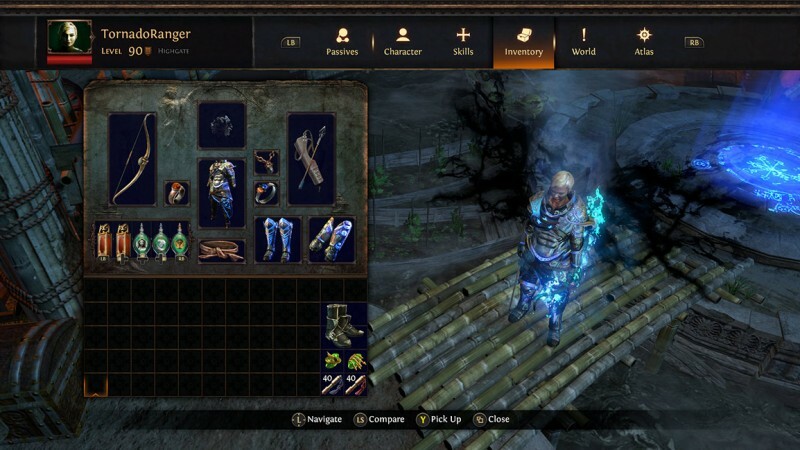 Unlike a game like Diablo III, where you can mix and match abilities to create new character builds whenever you feel like it, PoE is more deliberate. My first build was a zookeeper-style witch, which is a style of play that I usually enjoy. I squeaked through the campaign thanks, in large part, to her skeleton army. The Xbox One’s controller generally works well, and I was able to hang back and accurately fire off potshots while enemies were distracted by my minions. Casting spells that require precise placement was a bit trickier. Using an on-screen cursor to drop them into place is a clunky process that requires holding down a trigger and then the corresponding skill button. Life comes at you fast in PoE, especially when you’re a glass cannon, and an analog stick is no match for a mouse in some circumstances. Since characters share the same skill tree and have access to the same large pool of weapons, skills, and other items, I was concerned my next character would feel too similar. Thankfully, that wasn’t the case. My marauder is a melee maniac who sprints into enemy clusters and swings his axes until there’s nothing left to swing at. He feels completely different from my witch, which was exactly what I was hoping for. PoE has a lot of content to wade through in the lengthy campaign, which has more than doubled with the new expansion. While you keep a shared inventory stash between characters, your new heroes will have to play through the campaign again. The Fall of Oriath expansion removed the game’s previous loop of playing through the campaign multiple times at increasing difficulty levels, which is an improvement. 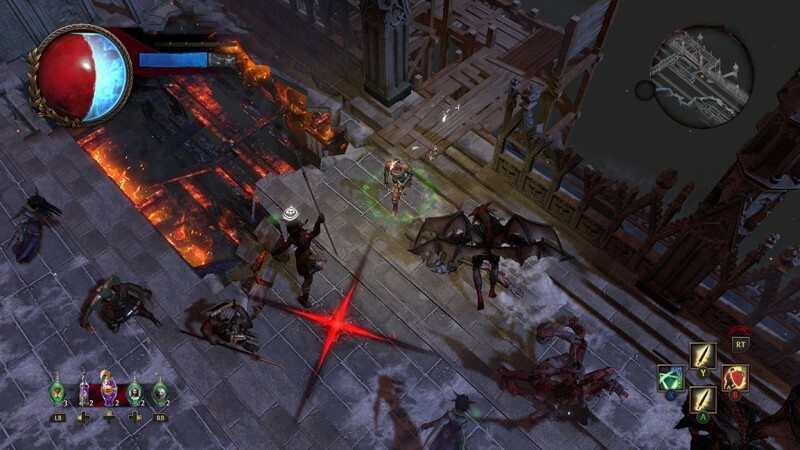 The overall story is fine, but considering how much variety the game’s randomly generated maps offer, I would have loved for my second character to have access to something similar to Diablo III’s adventure mode. There is a loose analog in PoE’s end-game atlas content, but that’s reserved for high-level characters. 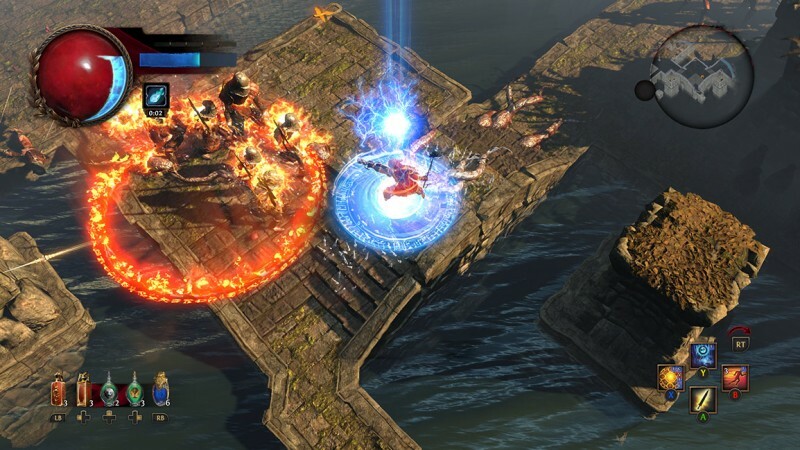 PoE is a free-to-play game, which means that there are microtransactions. Fortunately, they’re handled well. Aside from the ability to buy new character slots and add inventory space (which is, by default, generous), everything else is cosmetic. You can pay for spell effects, so that you hurl flaming skulls instead of fireballs, as well as a vast array of costume elements, pets, and weapon skins. Most importantly, the game’s economy – a huge part of the experience – is completely divorced from any for-pay elements. Instead, players buy and sell items using crafting items and other rare drops. I’ve been having a great time with PoE, and it’s fast become my go-to when I need to get in a rewarding grind. 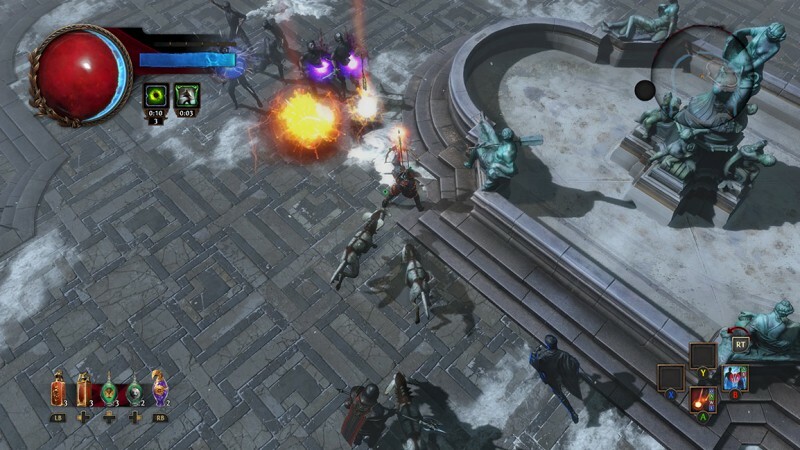 The Xbox One version may be a little late to the party, but it was absolutely worth the wait. This fantastic game takes the best of the genre and propels them to impressive new heights. Grinding Gear Games has methodically finessed PoE since release, and Xbox One players who drop into this dark fantasy world for the first time will reap the benefits.